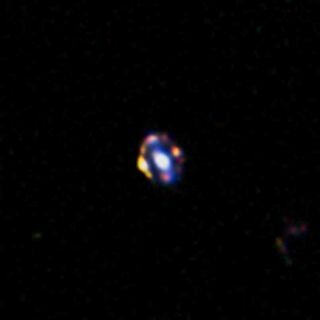 This picture, taken by the Hubble Space Telescope, reveals the most distant gravitational lens yet discovered. The glow at the center is the central regions of a normal galaxy. By chance it is precisely aligned with a much more remote, young star-forming galaxy. The light from the more distant object is bent around the nearer object by its strong gravitational pull to form a ring of multiple images. The most distant cosmic lens — a galaxy whose gravity warps and deflects light from an even more distant stellar nursery — has been discovered by an international team of astronomers. This so-called gravitational lens, which is so distant it takes the distorted light 9.4 billion years to reach Earth, can be used to measure the mass of the faraway galaxy, according to a new study. The discovery began as a fortuitous accident, said study lead author Arjen van der Wel, an astronomer at the Max Planck Institute for Astronomy in Germany. Researchers sifting through data collected by the Hubble Space Telescope stumbled on curious observations of a distant galaxy. The inconsistencies suggested light was being deflected from an even more remote object that was perfectly aligned with the galaxy. Gravity curves space and time, which means a more massive object in space will have a stronger gravitational pull. These forces bend light, warping how astronomers view cosmic objects through telescopes on Earth. As predicted by Albert Einstein's general theory of relativity, light that passes a distant galaxy will be affected by its gravity. As such, gravitational lenses can be useful tools. By measuring the distorted light, astronomers can determine the mass of the lensing galaxy, or the object causing the light to bend. Furthermore, the lens naturally magnifies the background light source, which enables astronomers to observe details of galaxies that would otherwise be too distant to see. When a gravitational lens is perfectly aligned with a distant source of light (in this case, the younger, faraway galaxy), an observer on Earth will see a circle of light. This is known as an "Einstein ring," and it represents the projected and magnified image of the more distant object. By comparing other images taken by the Hubble Space Telescope, and removing haze from the lensing galaxy's collection of stars, the researchers found a near-perfect Einstein ring, according to van der Wel. The astronomers can measure the distorted light to make direct calculations of the lensing galaxy's mass. Yet, the discovery has also unearthed new mysteries of the early universe. The more distant, magnified object in the study is known as a star-bursting dwarf galaxy. Typically, these types of galaxies are young, ranging from 10 million to 40 million years old, and produce new stars at a prolific rate. A gravitational lens of this kind — in which an older galaxy deflects the light of a younger, more distant star-bursting galaxy — was thought to be extremely rare. But, this is the second star-bursting dwarf galaxy that astronomers have detected through a gravitational lens. These results suggest young, star-bursting dwarf galaxies may be more common in the early universe than was previously thought, which could force scientists to rethink some of the most commonly accepted models of galaxy evolution. "This has been a weird and interesting discovery," van der Wel said. "It was a completely serendipitous find, it combines two rather disparate topics I have been working on — massive, old galaxies, and young, starbursting dwarfs — and it has the potential to start a new chapter in our description of galaxy evolution in the early universe." The detailed findings of the study were published online today (Oct. 17) in the journal Astrophysical Journal Letters.